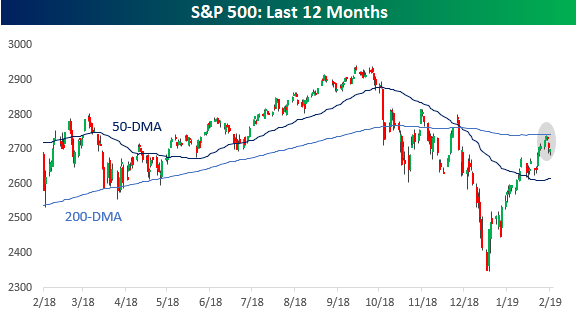 There’s been a lot of discussion regarding the S&P 500’s inability to trade above its 200-DMA after getting close to that level earlier this week. Like the index itself, the majority of the Industry Groups that make up the S&P have also been struggling to retake their 200-DMAs. The chart below shows the historical percentage of Industry Groups above the 200-DMA on a daily basis going back to 2014. Back in early January, this reading cratered all the way down to 4.3% when the only group above its 200-DMA was Household and Personal Products. In the month since then, we have seen the percentage slowly climb higher. While the percentage was close to 50% earlier this week, as the market has declined it also pulled back to the current level of 37.5%. In other words, the market still has a lot of work to do before this reading starts to look healthy again. 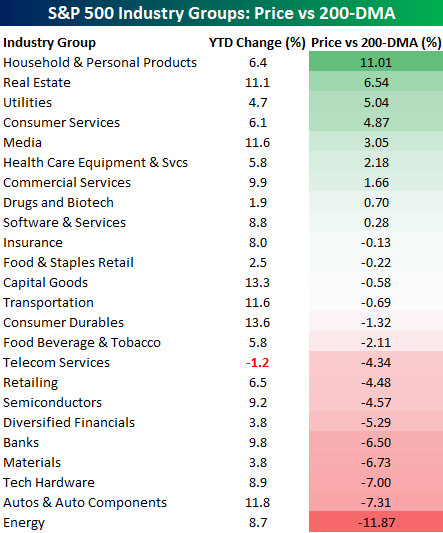 The table below shows the YTD performance of each of the 24 S&P 500 Industry Groups along with how far each of them is trading from their 200-DMA. This helps give us an idea of how quickly the percentage above their 200-DMA could theoretically rise or fall. For example, four groups are less than 1% below their 200-DMA, so even a moderate rally in the market could easily push the percentage back above 50%. After that, though, nearly a third of all the groups are still at least 4% below their 200-DMAs, so it’s going to take quite a move to get those groups on the right side. 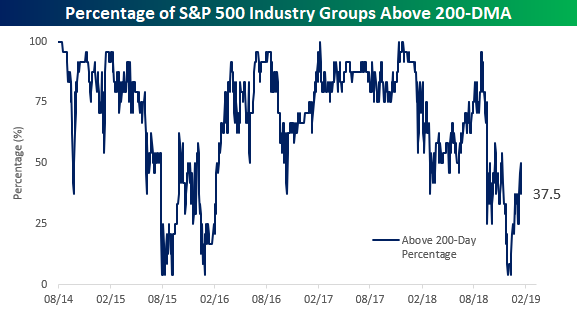 Conversely, only two of the nine Industry Groups above their 200-DMA are less than 1.5% above that level, so even if the market sees a modest sell-off, we aren’t likely to see much of a decline in the percentage trading above their 200-DMA. So far this year, the rally in equities has been broad-based. The only Industry Group down YTD is Telecom Services, which is down just 1.2%. On the upside, Consumer Durables (13.6%) are leading the gains, but another five Industry Groups are up by over 10%. Not a bad start.